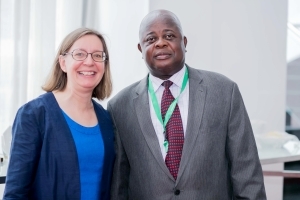 FIG Vice President Diane Dumashie and Director Louise Friis-Hansen visited Accra, Ghana to prepare for the Working Week that will take place in Accra, Ghana in 2021. The local organising committee had done a great job to prepare for this meeting. 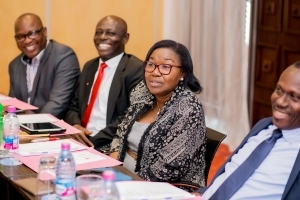 The meeting was held at the Marriott hotel in Accra, and at the meeting there were representatives from both member associations, GhiS and LISEC. 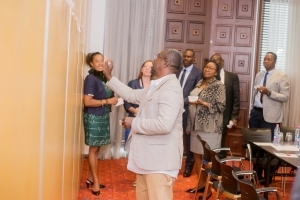 Hereto the Quantity Surveyors and cost engineers, Ghana Lands Commission, the Young Surveyors, ministry representative from the Ministry of Lands and Natural Resources, and the industry were represented. Further to this the Working Week is endorsed by the Ministry of Tourism. Already now there has also been contact with the Ministry of Foreign Affairs. A new International airport terminal has just opened in Accra and the ministry is working on the possibilities for e-Visas. The diversity of the Local Organising Committee is an advantage and will secure that the Working Week programme will be broad and include many interesting areas. 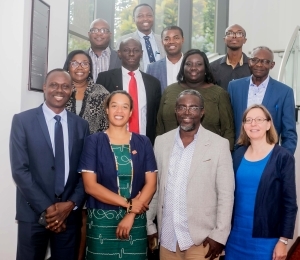 There were longer and fruitful talks about the legacy of the Working Week - both for Ghana and the Ghanaian surveyors, and for the International participants. The local organising committe has been formed and the roles are now being distributed among the members. Apart from the content of the Working Week it was also discussed at what venue the conference will take place, and the participants of the meeting was at a site visit to several potential sites. There was no decision on this, as this demands a further assessment study. The dates for the Working Week were decided: Monday 24 - Friday 28 May 2021. It was great to also see the Young Surveyors represented at the Local Organising Committee as it is important to get students and young professionals engaged. 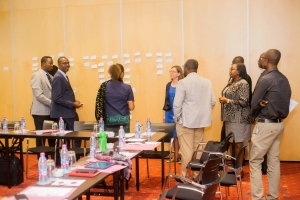 The overall theme of the Working Week was discussed, and there will be futher discussions on this in order to be sure that the right themes will be included. On day two of the meeting there was a visit to the Mayor of Accra, Hon. Adjei Sowah M. There was a good discussion on the development of Accra and how the orgahising committee and the city can work together on the Working Week. It was very interesting to hear about the development of the city of Accra and Mayor Hon. Adjei Sowah pointed out that he would be looking forward to a strengthened relationship with surveyors, architechts and other groups and that their voices will be heard. This more organised approach will be beneficial for Accra, and the mayor is working on a masterplan, among other things inspired by the development that has taken place in Singapore. There was also time to see parts of the beautiful and exciting city of Accra. 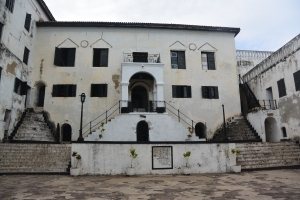 Among other things there was a visit to the Independence Square which contains monuments to Ghana's independence struggle, including the Independence Arch, Black Star Gate, and the Liberation Day Monument. These symbols are used in the logo for the Working Week 2021. The logo also contains the typical colours of Ghana - Red, Green and Golden. 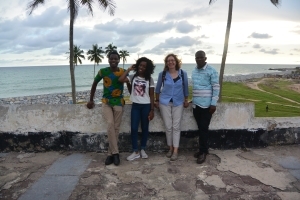 After the official meeting, Louise had a very interesting trip outside of Accra together with two Young Surveyors, Paa Kwesi Akuffo Ensaw and Priscilla Djaba. 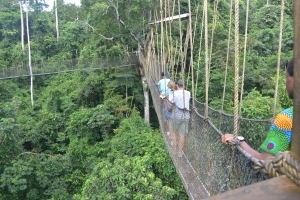 The trip went first to the Kakum National Park, which was a magnificient experience. 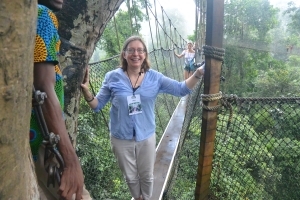 Here it is possible to take a round-trip hike learning about the area and the different species, or to do the The Kakum Canopy Walk which is absolutely breathtaking as it connects seven tree tops. 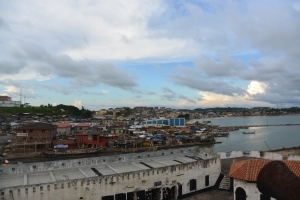 Hereafter the trip went to Elmina Castle, which is one of the castles along the coast that has in former times been used for shipment of goods and slavery. Thanks to all who participated during these three very well organised days, and especially thanks to Kwame Tenadu and Stephen Djaba for their competent organisation of the visit.